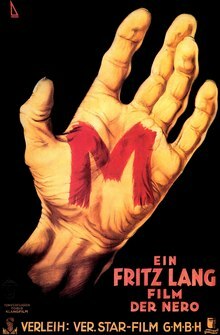 Fritz Lang’s 1931 film “M” has long been on my list of “Oh, yeah. I’ve been meaning to see that” movies. Last weekend, after screening of “The Maltese Falcon,” Peter Lorre’s presence reminded me, so I put it into my Blockbuster queue and popped it to the top. Fritz Lang’s “Metropolis” (recently restored to its full magnificence) is on my Top Ten list. His innovation, his iconic long-shots, his metaphoric storytelling, I love it all. But somehow, I’d managed to miss seeing “M” for decades. If I had seen this film before–even just a year ago–my reaction to it would have been different. Seeing it now, after the abominable crime perpetrated in Newtown, CT has entered our public consciousness, my reaction is very different. Possible spoilers after the jump.